Hello everyone, so it's been awhile since I last talk about my shopping experience but today I have something super nice to share! I was actually invited by HK Station @ Sungei Wang Plaza to try & shop for looks under RM200 and also model the clothes. This is super exciting coz who doesn't love cheap deals am I right?? Well look no further coz Sungei Wang Plaza has created a whole floor for your shopping experience at such low low prices! I know the place can be quite confusing at times, even I was afraid I would get lost but I just straight away went to the Yellow & Orange section and take the lift there to Level 6 and voila I've arrived! Infront of the lift at Level 6 which looked like I just stepped out of the LRT, lolz. 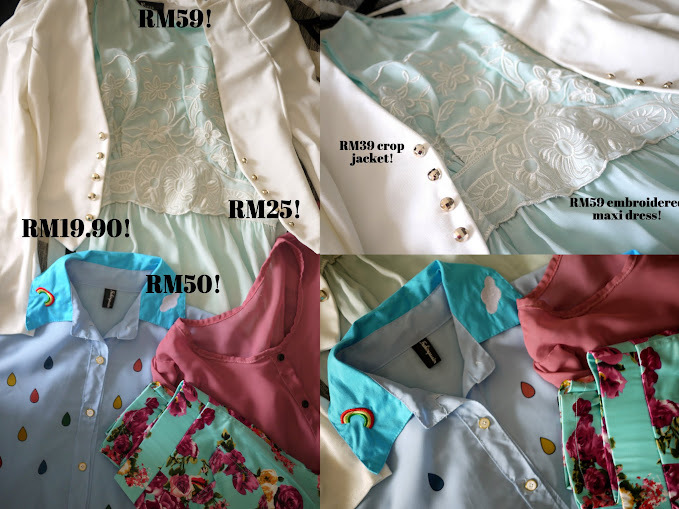 These tops are only RM25! Purses & bags that starts as low as RM10, perfect as gift ideas aye? Got myself this billowy sleeved chiffon top at only RM25, yippee! Geometric print peplum top ♥ I think I'm gonna come back to get this one, they even have it in different colors! As you can see there are a lot of different shops in this floor, just walk around and try on (if the seller allows it) anything that attracts you because chances are you probably won't get them as low as this anywhere else in the country hehe.. This bag is really cute! And don't forget to drop by Sungei Wang Plaza, go to Yellow or Orange zone and take the lift to Level 6.
ohmygod, the bags are only rm10?? bole jd gilaa,hahah..
baju yang last tu cantikkkkk!